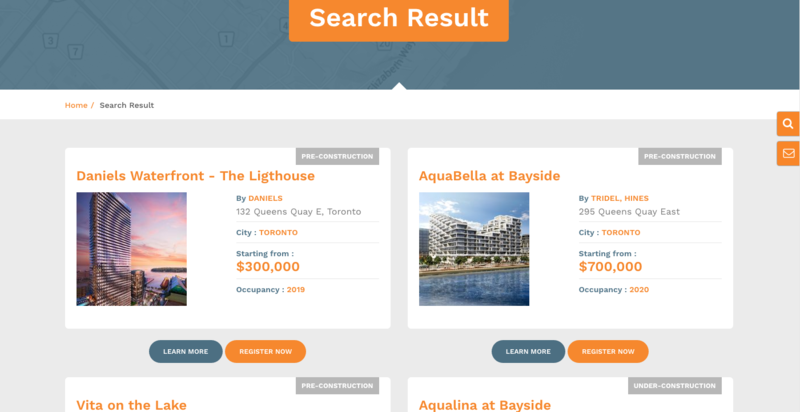 We are excited to announce the launch of our brand new spanking website, designed from the ground up to make the condo shopping experience as smooth and hassle free as possible. When you first land on our page you will be greeted by our homepage, with its striking blue banner and search bar. The easiest way to shop would be to type in a search term and see what comes up. Why don’t we try running a search and seeing what comes up? Since moving to the waterfront, I’ve been really digging the lakefront lifestyle, so I think I will search for something that is on the water. I’ll try typing “waterfront” and see what comes up. Success! It seems our search function is working as expected. At this point you can scroll down to get a glimpse of the projects listed. Clicking on any of these fields (with the exception of price) will show you results matching that field. For instance if I click 2019, I will be presented with a list of condos with an occupancy in 2019. If I click on Toronto, I will see a list of condos in Toronto. Easy as pie, right? 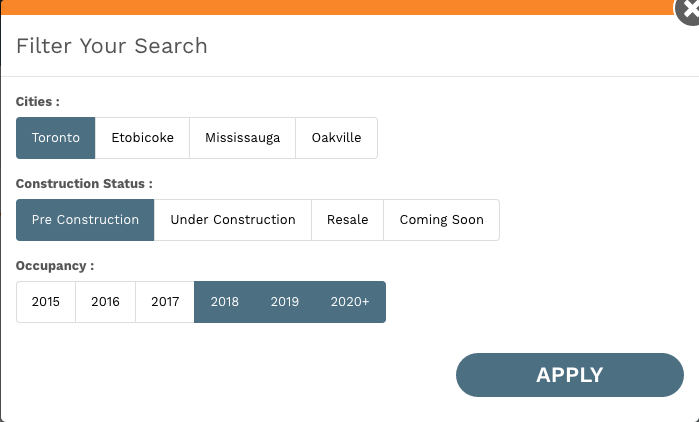 In this case I am looking for condos in Toronto, that are in pre-construction, with expected occupancy dates of 2018, 2019, and 2020+. You can mix and match any of these options to find what you are looking for. Now, getting back to the search… If you find yourself too busy to read up on the individual condos, and just want to save this list for later, you can use our handy e-mail feature to e-mail a list of your search results. Once you click submit, we will send you an e-mail with links to each project on your search results page. Now that you’ve narrowed your search down, you are ready to delve deeper into the mysteries of each condo. Clicking on a project will take you to a more detailed page. 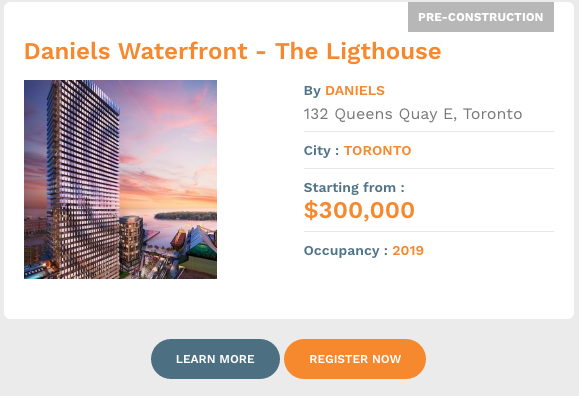 Here you will find a summary of the project, renders, details, videos, a list of the condo amenities as well as a google map, complete with walk, transit, or bike score if available. 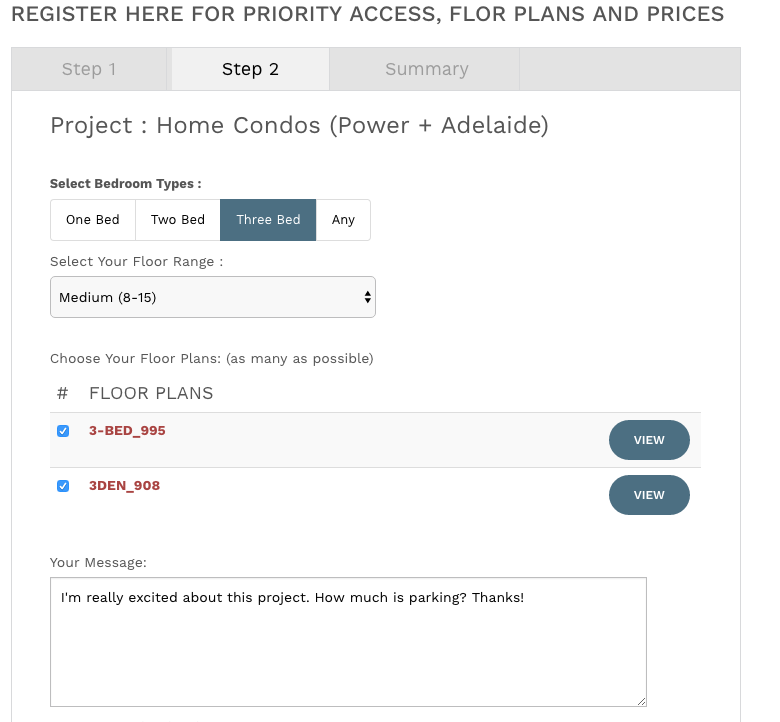 Clicking on the Floor Plans button will grant you access to available plans, sorted by type of unit. 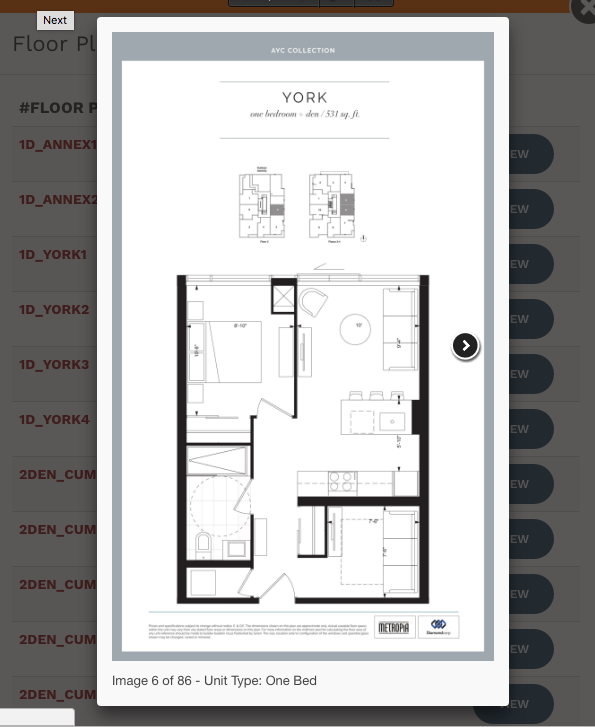 You can click view to browse through these floor plans. If you find the floor plans are too small to fully appreciate you can also maximize them. If you think you’ve learned enough and are ready to take the next step, simply register for more information. 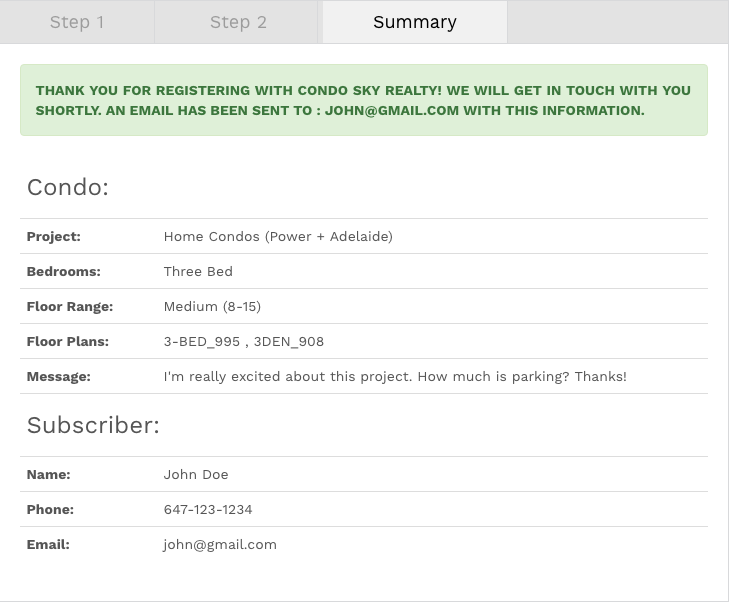 Registering will grant you access to important information about the project that is not available on our website. Narrow down your choices using the Bed Room Types filter. Let us know if you prefer a low, medium, or high unit (or leave it blank if you’re undecided) and select the floor plan(s) that you are most interested in. Once you’re done, you can leave us a note in case you have any questions, or preferences you want to make clear. Hit submit and you’re done. At this point, one of our friendly and knowledgeable agents will get in touch with you to help you to answer any questions you may have and to help you sort through the finer details. 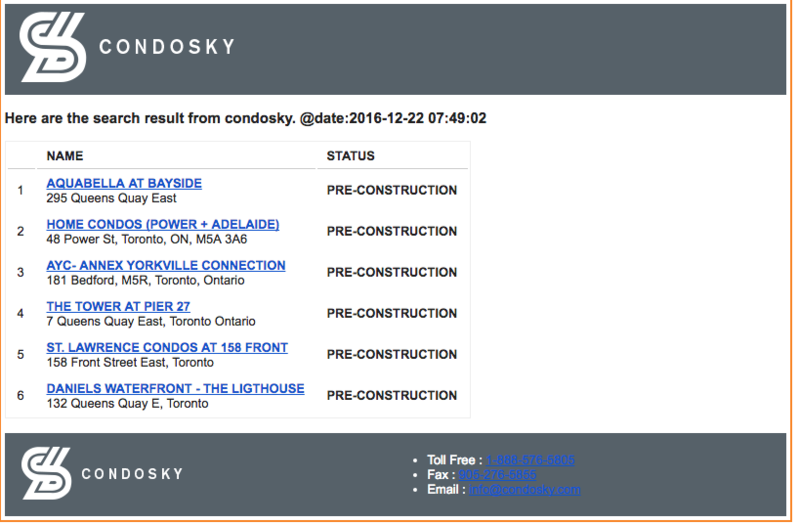 Congratulations, you’ve just registered for your first condo on Condosky.com. We hope the experience was as exciting and seamless as we envisioned it. Be sure to keep an eye on this blog for market updates, condo news, investment analysis, DIY home projects, and so much more.